Background & Objective: Many targeted ovarian cancer patients are resistant to olaparib treatment. Here we seek to understand the underlying molecular events and search for potential combinational therapeutics to surmount the intrinsic olaparib resistance in human ovarian cancer. Methods: The cytotoxicity was determined by the MTT assay and cell viability was measured using Cell Counting Kit-8 (CCK-8). Protein expressions of ERK, P38, JNK, ERK5, LC3, N-CADHERIN, α-SMA were determined by western blotting. The invasion capacity was evaluated by the transwell chamber. Autophagy flux was monitored by the LC3 puncta formation. The epithelial-mesenchymal transition (EMT) markers were profiled by immunoblotting detection. The in vivo tumor progression was determined by xenograft mice model. Results: The olaparib-resistant cell lines were successfully generated in both SKOV3 and A2780 cells. The proliferative index was significantly higher in resistant cells in comparison with sensitive counterparts in the presence of olaparib. Both P38 and JNK were up-regulated in olaparib-resistant cells. 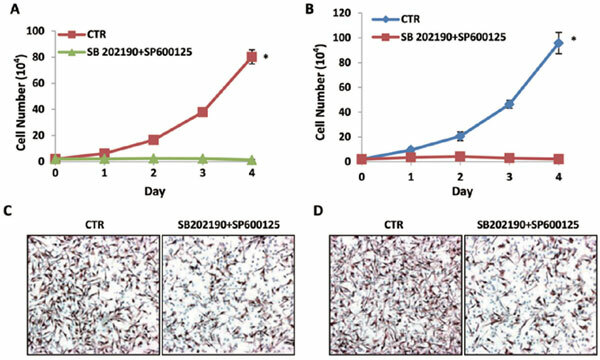 The combinational treatment with P38-specific inhibitor SB202190 and JUN-specific inhibitor SP600125 significantly suppressed cell growth and migration, which was further attributed to the induction of autophagy flux and inhibition of EMT processing. We further consolidated the anti-tumor activities of SB202190 and SP600125 in xenograft mice. Conclusion: Our data suggested that aberrant over-expression of P38 and JNK is causally linked to the olaparib resistance in ovarian cancer. Combination of P38 and JUN inhibitors demonstrated significant anti-tumor activity both in vitro and in vivo. Our study highlighted the potential therapeutic value of Mitogen-Activated Protein Kinase (MAPK) inhibitors in olaparib-resistant human ovarian cancer. Olaparib, ovarian cancer, SB202190, SP600125, MAPK, anti-tumor.